I am sure at some point you’ve heard or read that the most important thing in life is the dash between birth and death. In other words, it’s what we do with the life we’ve been given that is most important. But what is the “stuff” the dash is made of? I suggest memories is the “stuff” the dash is made of. Our lives consist of memories some bad, some good, some neutral. I looked in the dictionary for the meaning of memories and found it lacking in the “stuff” our lives consist of. Memories are much more than something stored in a part of our brains. They are living experiences not only captured in our brains but also mold into who we become. Memories are not only historical they are also active in our day-to-day living. I am that little boy in 1953 when a tornado picked our house up and landed in 20 feet in our front yard. I am that little boy protected by the strong arms of my father as we rode out the storm. 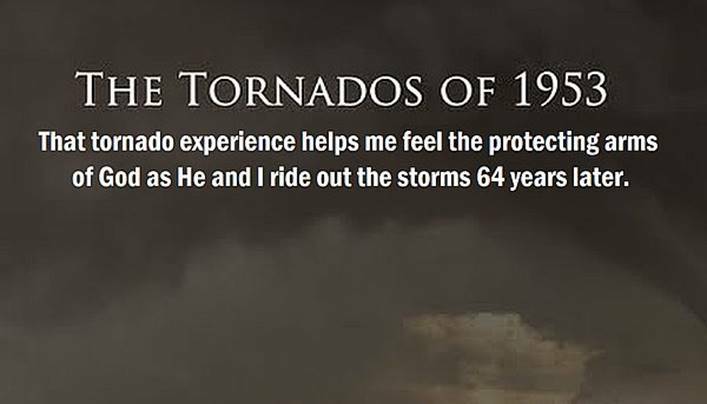 I am the 71-year-old man whose memory of that experience helps me feel the protecting arms of God as He and I ride out the storms 64 years later. Please take some time today for God and let Him share a few of your memories with you. You will be Blessed!